For the first time in in its history, the US national debt surpassed $21 trillion this week, according to the US Treasury. When Trump took office on Jan. 20, 2017, the national debt was $19.9 trillion. Since then, the GOP-led Congress has passed a $1.5 trillion tax cut bill and a two-year spending deal which, together, are expected to drive the deficit and debt further upward. The Committee for a Responsible Federal Budget estimates annual deficits could top $2.1 trillion per year in the next decade, which would send the national debt soaring even higher. Republicans railed against the national debt level under the Obama administration, when it jumped from $10.6 trillion to $19.9 trillion, but few have been as outspoken about the situation with Republicans controlling Capitol Hill and the White House. Sen. Rand Paul, RKentucky, held up the spending bill last month on the Senate floor, blistering Republicans for doing exactly what they had criticized the Obama administration for doing. Saudi Arabia’s crown prince Mohammed bin Salman’s in an interview with “60 Minutes” highlighted: “Without a doubt, if Iran developed a nuclear bomb, we will follow suit as soon as possible.” The interviewed aired just days after Saudi Arabia’s Cabinet approved the country’s nuclear energy policy, which clearly spells out Riyadh’s intention to develop its own nuclear activities. It comes amid the start of the crown prince’s trip to the US, as well as negotiations between Washington and Riyadh that the latter hopes will permit U.S. companies to assist the desert kingdom in fulfilling its nuclear energy ambitions. Two primary concerns are driving Saudi Arabia’s pursuit of a nuclear program: energy and security. Riyadh might sit atop the world’s largest cache of oil reserves, but the country has an energy problem. In the past, Saudi Arabia has burned over 1 million barrels of oil per day for power generation during seasonal peaks. In an effort to diversify, the country has targeted the development of nuclear energy, renewables so it can — like most of the world — cease burning crude oil for electricity generation and water desalination. Riyadh endeavors to construct 16 nuclear reactors with a capacity of 17.6 gigawatts by 2032. Former French President Nicolas Sarkozy was placed in custody on Tuesday as part of an investigation into claims that he received millions of euros in illegal financing from the government of the late Libyan leader Muammar Gaddafi, a legal source told AFP. The news agency reported that Sarkozy was being held at the Nanterre police station, west of Paris, where he had reportedly been summoned by anti-corruption police officers. The former French leader had until now refused to respond to a summons for questioning in the case, which drew heightened scrutiny last November when a businessman admitted delivering three cash-stuffed suitcases from the Libyan leader as contributions towards the French leader’s first presidential bid. The former president’s detention comes more than a year after French-Lebanese businessman Ziad Takieddine repeated claims that he delivered suitcases from Libya containing 5m euros ($6.2m) in cash to Sarkozy and his former chief of staff Claude Gueant. It is alleged that three cash handovers took place at the Interior Ministry, while Sarkozy was interior minister in late 2006 and early 2007. On each trip Takieddine carried a suitcase with around 1.5m to 2m euros in 200-euro and 500-euro notes, it is alleged. Soon after becoming the French president, Sarkozy invited the Libyan leader to France for a state visit and rolled out the red carpet. Sarkozy then put France in the forefront of Nato-led air strikes against Gaddafi’s troops that helped rebel fighters topple his government in 2011. 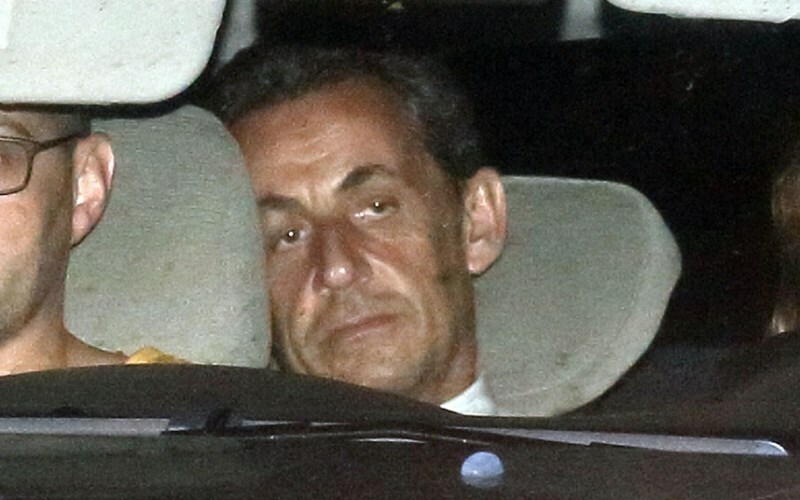 It is not the first time that Sarkozy has faced legal troubles. In February 2016, he was handed preliminary charges by French magistrates for suspected illegal overspending on his failed 2012 re-election campaign and ordered to stand trial. Britain, France and Germany have proposed fresh EU sanctions on Iran over its ballistic missiles and its role in Syria’s war, according to a confidential document, in a bid to persuade Washington to preserve the 2015 nuclear deal with Tehran. Trump delivered an ultimatum to the European signatories on Jan. 12. It said they must agree to “fix the terrible flaws of the Iran nuclear deal” – which was sealed under his predecessor Barack Obama – or he would refuse to extend U.S. sanctions relief on Iran. U.S. sanctions will resume unless Trump issues fresh “waivers” to suspend them on May 12. These events are a good lesson for all present Muslim rulers, who rush to seek favour with America and Western powers. It was America that had led efforts to bring a degree of normalisation to relationships with Iran, simply because America needed Iranian participation in Iraq and Syria. However, now that Iran’s role is coming to an end there, America has switched its attentions to the Saudi regime and is pushing back against Iran’s growing regional role. There is nothing to gain from cooperation with Western regimes against the interests of Muslims. They have no loyalty to anything but their own interests. And Muslim leaders courting them are also courting disaster in both this world as well as the hereafter. Europe’s present predicament is also evidence of European weakness, particularly because of its dependence on energy sources outside its region. The European powers rushed to join America in negotiating with Iran because of Iran’s vast oil potential. True economic strength comes not simply from economic output but from access to and control over economic inputs, most significant of which is natural resources. Allah has blessed Muslims with abundant natural resources and energy supplies, so why then do our leaders seek the patronage of the Western foreign disbeliever? The United States has not yet seen Pakistan take significant steps to clamp down on the Afghan Taliban and the Haqqani network militant groups, a senior U.S. administration official said on Friday. The administration suspended about $2 billion in security assistance to Pakistan in January but Islamabad has failed to take “the kind of decisive and irreversible action” Washington has asked for to help with the war in Afghanistan, the official told reporters. The administration has been frustrated by what it sees as Pakistan’s reluctance to act against the Afghan Taliban and the affiliated Haqqani network. Washington believes the groups use Pakistan as a safe haven for launching attacks on neighboring Afghanistan. Pakistan denies helping the militants. The United States has been at war in Afghanistan since 2001, making it America’s longest military conflict. President Donald Trump agreed in August to a stepped-up military campaign against the Taliban, and has since increased pressure on Pakistan to help. U.S. Defense Secretary Jim Mattis on Tuesday said he has seen some positive signs from Islamabad, including Pakistani military operations along the border – and the senior administration official agreed. “I think the Pakistanis have wanted to appear responsive to our requests,” the senior administration official said, speaking on condition of anonymity. “What I would say is, they have done the bare minimum to appear responsive to our requests,” the official said, saying more proactive steps were needed. The Pakistani leadership knows full well that fulfilling America’s demands is a suicidal prospect that will result in lasting damage to not only Afghanistan but also Pakistan, deeply compromising Pakistan’s security in the face of ongoing challenges from the Indian military and intelligence establishment. But Pakistan is deeply mistaken in thinking that it can somehow continue to service its relationship with America while also preserving its own interests. America is struggling to maintain its fragile hold on Afghanistan and its desperation and arrogance are resulting in its continued lashing out at Pakistan; America cannot be pacified any longer with minimal steps from Pakistan. It is necessary that the Pakistani ruling class make a clear decision as to whether they wish to continue with their subservience to America or whether they are ready to stand for their own real interests and those of the people of Pakistan. And it is necessary that the Muslim Ummah takes responsibility for its own affairs and ejects leaders that betray it and its noble Deen. Xi Jinping started his second term as China’s president on Saturday, flanked by a new vice president, Wang Qishan, who even without any other titles to his name is shaping up as a potent deputy to Mr. Xi, with a potentially powerful say in grappling with the Trump administration over trade disputes. “Wang Qishan is one of the most important figures in Xi’s inner circle, and this position allows him to retain a formal position,” said Wu Qiang, a former lecturer in political science at Tsinghua University in Beijing who now works as an independent researcher. Despite Western media reports, the strengthening of Xi has been collectively decided by the Chinese ruling elite and is not simply a personal coup by Xi Jinping. This strengthening was necessary because of numerous internal and external problems faced by China in recent years, not least the formidable challenge presented by America. In fact, strong individual rule is not only essential to developing cohesive policies and ensuring speedy implementation, it is also the most transparent method of running government because the actions of the individual are on continuous public display for everyone to witness. The Islamic ruling system, by entrusting the Khalifah (Caliph) alone with the entire mandatory powers of the state, achieves the most transparent form of government possible, making the Khalifah personally accountable to the state citizenship for any and every failing of the state. This is in contrast to the Communist’s conception of ‘collective leadership’ and the West’s theory of ‘separation of powers’ and their portrayal of one-man rule as being ‘dictatorial’, despite knowing that one who is bound by a strong legal framework can never be dictatorial. With Allah’s permission, the Islamic ruling system will soon be re-established in the form of the righteous Islamic Khilafah (Caliphate) State on the method of the Prophet ﷺ that will implement Islam, sincerely care for the affairs of Muslims as well as the non-Muslim citizens it is entrusted with, and carry the light of Islam to the entire world.